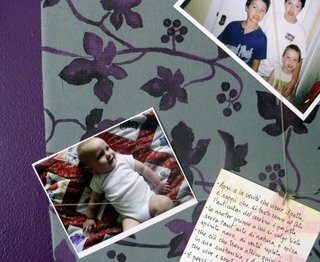 HOW: hgtv.com has a good tutorial under the heading "memory board". I did not use quilt batting like they do because I didn't want the board to be poochy, but batting would improve the holding power of the elastic. NOTES: The fabric covering this board is a 1995 design called "Runo" by Kristina Isola for Marimekko. (The Crate & Barrel Outlet in Chicago carries discontinued Marimekko fabrics at $8.95/yd the last time I checked). I didn't want the strings that hold the cards and photos to obscure the pattern, so I looked for purple elastic everywhere and then happened on clear elastic for beading at Target. The pewter pushpins hold the elastic bands in place where they intersect. It's best to have a helper when making this board because holding the fabric and then the elastic taut for stapling is just not a one woman job. I also recommend using small lengths of thick (broccoli stem holding) rubberband under the elastic where you staple it to give the staples a better grip.